Using physical chemistry methods to look at biology at the nanoscale, a Lawrence Berkeley National Laboratory (Berkeley Lab) researcher has invented a new technology to image single molecules with unprecedented spectral and spatial resolution, thus leading to the first “true-color” super-resolution microscope. Ke Xu, a faculty scientist in Berkeley Lab’s Life Sciences Division, has dubbed his innovation SR-STORM, or spectrally resolved stochastic optical reconstruction microscopy. Because SR-STORM gives full spectral and spatial information for each molecule, the technology opens the door to high-resolution imaging of multiple components and local chemical environments, such as pH variations, inside a cell. The research was reported in a paper titled, “Ultrahigh-throughput single-molecule spectroscopy and spectrally resolved super-resolution microscopy,” with co-authors Zhengyang Zhang, Samuel Kenny, Margaret Hauser, and Wan Li, all of UC Berkeley. Xu is also an assistant professor at UC Berkeley’s Department of Chemistry. What’s more, SR-STORM is high-throughput, able to deliver spatial and spectral information for millions of single molecules in about five minutes, compared to several minutes for a single frame of image comprising tens of molecules using conventional scanning-based techniques. Xu built on work he did as a postdoctoral researcher at Harvard with Xiaowei Zhuang, who invented STORM, a super-resolution microscopy method based on single-molecule imaging and photoswitching. By devising a dual-objective system with two microscope lenses facing each other, Xu and colleagues viewed the front and back of the sample at the same time and achieved unprecedented optical resolution (of approximately 10 nanometers) of a cell. Using this method to image neurons, they showed that actin, a key component of the cytoskeleton (backbone of the cell), has a different structure in axons than in dendrites, two parts of a neuron. But current super-resolution microscopy techniques do not deliver spectral information, which is useful for scientists to understand the behavior of individual molecules, as well as to enable high-quality multicolor imaging of multiple targets. Next they dyed the sample with 14 different dyes in a narrow emission window and excited and photoswitched the molecules with one laser. While the spectra of the 14 dyes are heavily overlapping since they’re close in emission, they found that the spectra of the individual molecules were surprisingly different and thus readily identifiable. “That’s useful because it means we had a way to do multicolor imaging within a very narrow emission window,” Xu said. Indeed, using four dyes to label four different subcellular structures, such as mitochondria and microtubules, they were able to easily distinguish molecules of different dyes based on their spectral mean alone, and each subcellular structure was a distinct color. Many diseases are caused either by an invading pathogen or degradation of a cell’s internal structure. Alzheimer’s, for example, may be related to degradation of the cytoskeleton inside neurons. 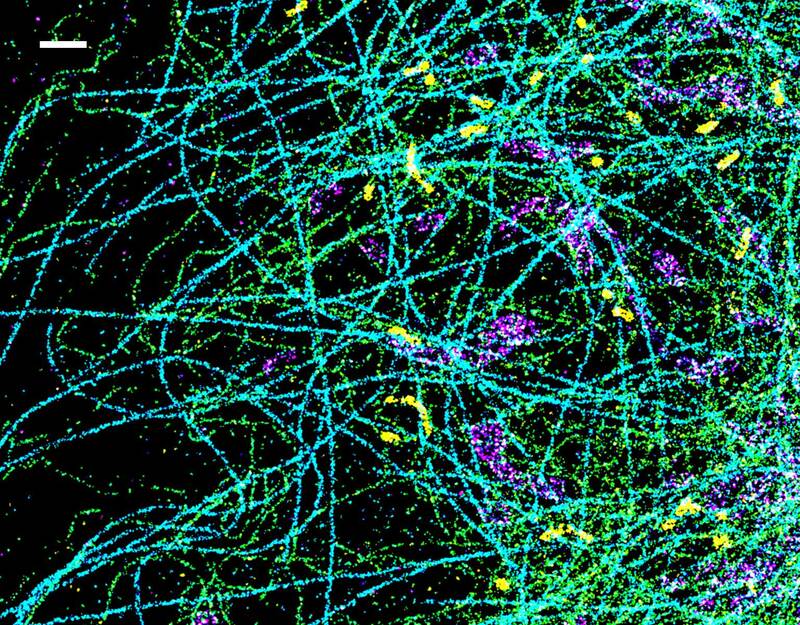 “The cytoskeleton system is comprised of a host of interacting subcellular structures and proteins, and our technique will enable research on the interactions between these different targets with unprecedented number of color channels and spatial resolution,” he said. Next, Xu is trying to refine the method by using a single-objective system, and make it work with conventional microscope systems, thus making it more broadly accessible. He is also trying to develop suitable dyes and probes to monitor the local environment, such as the pH, in live cells at the nanometer scale.